In the same way that Judi Dench won an Oscar in 1999 for eight minutes of screen time in “Shakespeare in Love,” Ms. Ferriss’s prologue is a doozy at a mere 11 pages. She has a real knack for creating dramatic tension. "Lucy Ferriss’s The Lost Daughter delivers the goods: flawed but sympathetic characters and a plot that will keep readers turning the pages voraciously. From its harrowing prologue to its final sentences, I was emotionally engaged with this fine novel. Ferriss is a masterful storyteller." 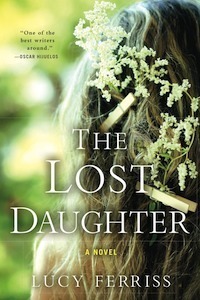 "The Lost Daughter is a complex, engaging novel about guilt, secrecy, and the mysteries of family. Lucy Ferriss is a courageous and thought-provoking writer." The Lost Daughter began with headlines. Police had been finding the tiny remains of unwanted babies in dumpsters and restrooms. This wasn't news. What was news was that the parents turned out to be middle-class teenagers. How could this have happened? Well, I thought, I know how it happened. And so I set out to write a depressing story. But along the way, my teenaged characters, never caught, grew up. They kept their guilt buried inside them, carrying it as we all carry the mistakes of our past, letting them weigh us down. Then, surprisingly, I discovered this: the baby lived. And The Lost Daughter was born. "An unflinching study of parenthood . . . convincing, Franzen- style realism . . . A powerful domestic novel." "This achingly beautiful novel is the work of a master American realist. With spell-binding attentiveness and intimacy it explores what a husband and wife can be sure they know about each other, but also the inaccessible places where the hidden past lies threateningly coiled, and which love must also find a way to reach."